Being overweight is too often viewed as a temporary problem that can be quickly overcome with a few weeks or months of determined dieting and strenuous exercise to burn calories. This view is promoted by various television programs such as the 'Biggest Loser'. However, as most dieters know, it is hard to lose weight and even harder to keep it off. Similarly, many dieters get discouraged at how long it takes to shed those excess pounds or kilograms. Most medical websites, experts and health organisations, push the idea that dieters should aim for loss rates of 1-2 pounds per week (0.5-1 kg per week) and that loss rates of 4 pounds (2 kg) per week are achievable with extremely low calorie diets and heavy exercise. Are these goals realistic? Many advocates of various diets such as low carb, high protein, low fat, calorie restricting diets, extremely low calorie diets and intermittent fasting (5:2 2-day Fast Diet, skipping meals) make many claims about the expected weight loss rates. Gastric lap band surgery is promoted as a sure-fire way to lose weight excess weight. During various procedures the size of the stomach is restricted to about 1/2 cup, about 90% less than the normal size of about 6 cups. There is a growing movement for virtual lap bands – designed to do the same thing with tiny meal portion sizes to avoid the risk and cost of surgery. However, one ingredient is missing ‘Willpower'. Despite all the claims there is very little information on the weight loss rates achievable with various diets and weight loss strategies. What weight loss rates are really achievable? 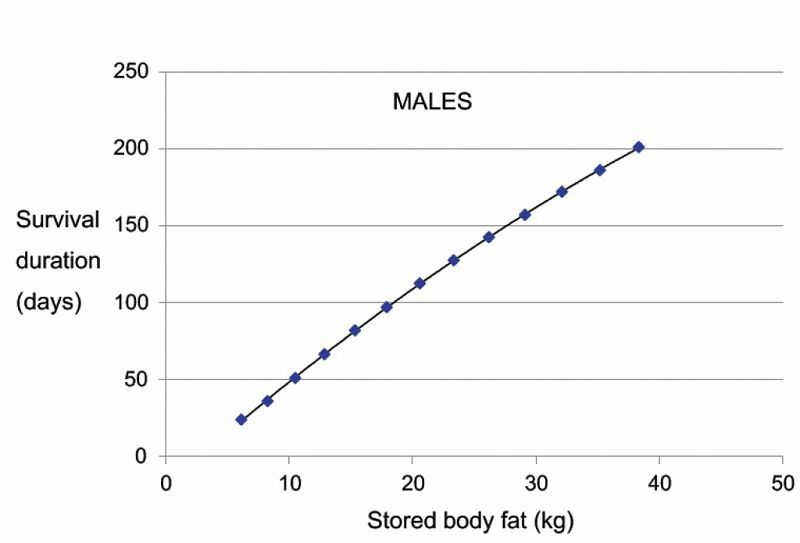 This article reviews the available literature on what weight loss rates have actually been achieved with various methods. 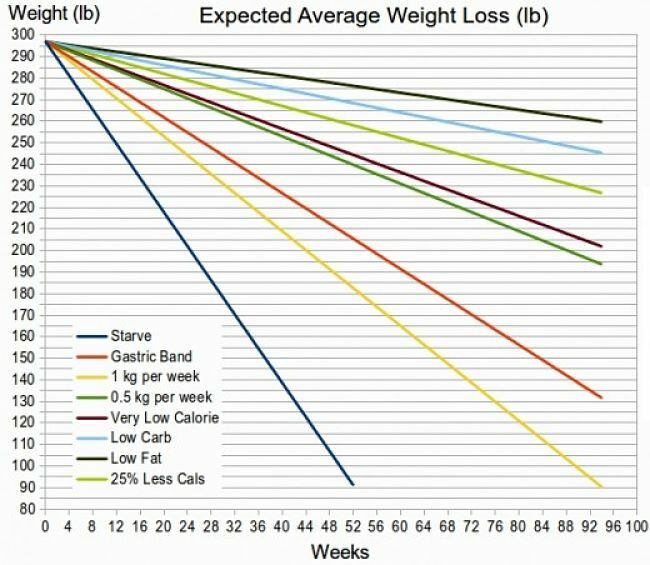 These data are used to define realistic expectations for weight loss rates over about 6 months. Like any procedure the weight loss rates expected and actually achieved varies enormously. Despite only having a stomach size of 1/2 cup some people still manage to eat a lot of calories by eating extremely high calorie foods. Loss rates are high initially be then decline for various reasons - partially because a lighter body needs much less eneergy to sustain itself and people become more active. 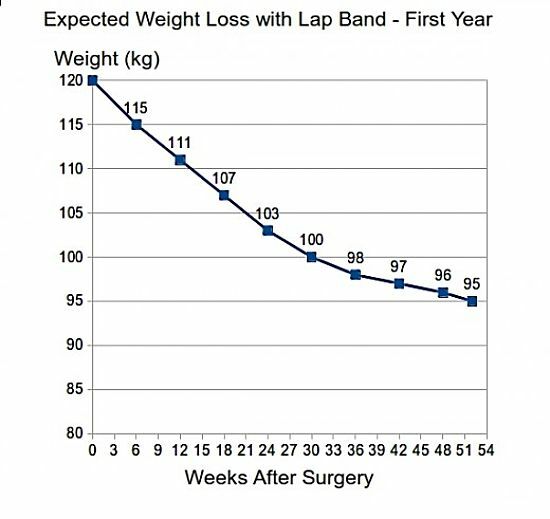 The expected weight loss trajectory after gastric band surgery over 12 months is shown below. 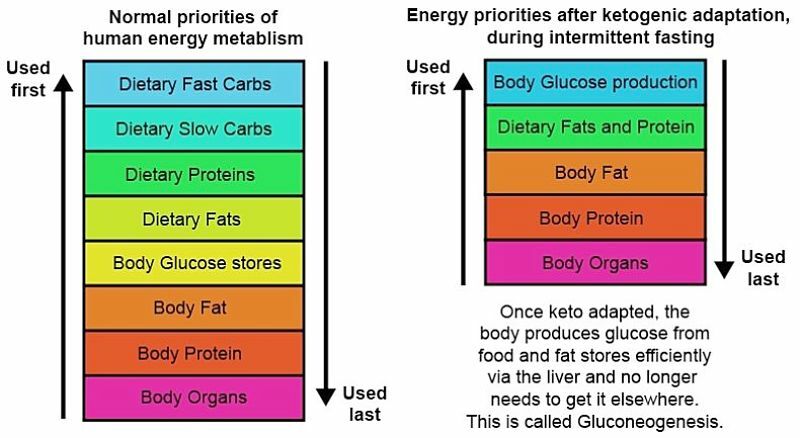 Most traditional weight loss methods are designed to restrict the number of calories eaten by 10-50% by adopting various strategies: Low carbs, low fat, high protein and various types of fasting ( 2-days per week fasts and daily fasts by skipping lunch or controlling portion sizes. 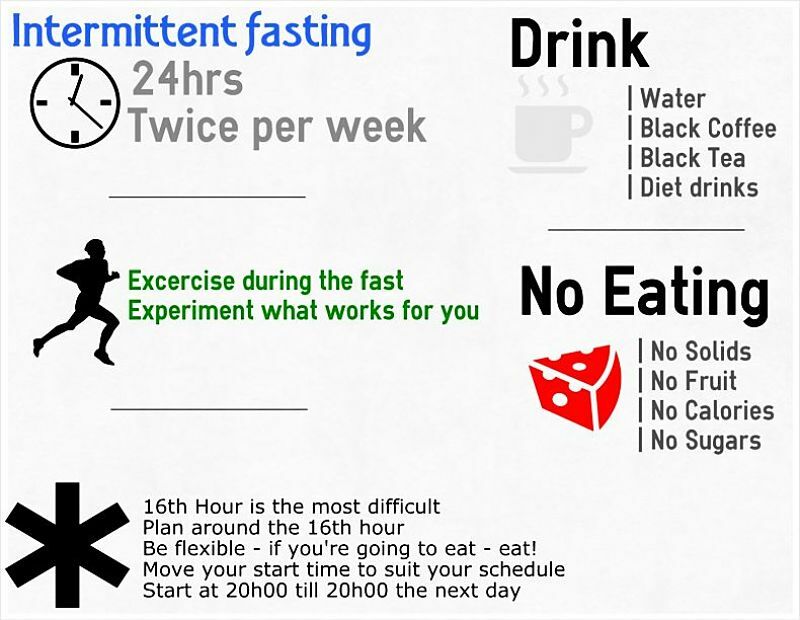 One extreme example of this iis the very low-calorie diet (VLCD). Prepared meal replacement formulas are used to restrict the daily diet to only 600- 800 calories per day (a reduction of 50-70% from the normal calorie intake). 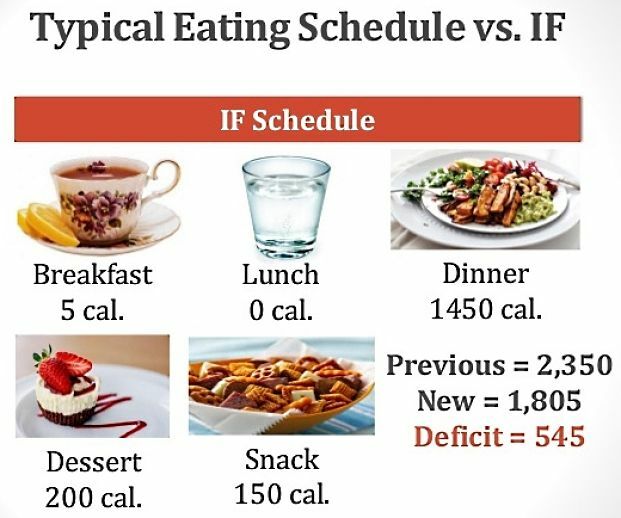 This intake level is also suggested for the so called 5:2 diet that has become very popular recently (5 days normal eating and 2 days of fasting eating 600 calories per day). The claimed average weight loss from these diets is about 20 kg (44 lb) over 12 weeks which is a rate of about 1.6 kg (3.5 lb) per week. 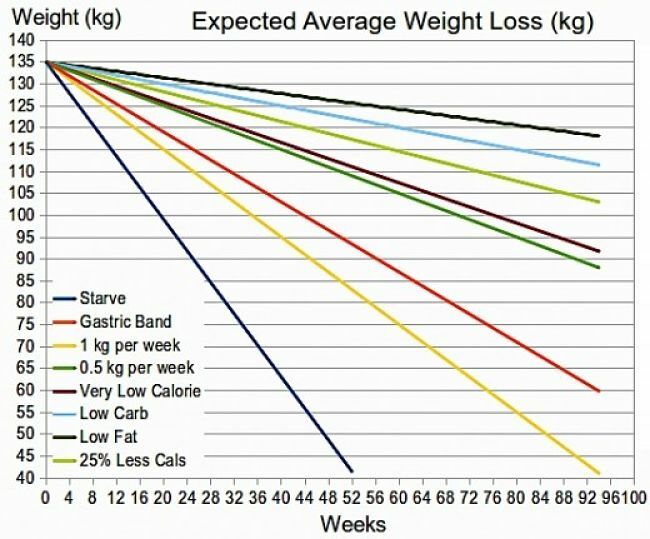 However the loss rates over 6 months on 800 calories per day is less than this and averages about 12 kg (26 lb) over 6 months Like most diets the rapid initial loss rate is hard to sustain. 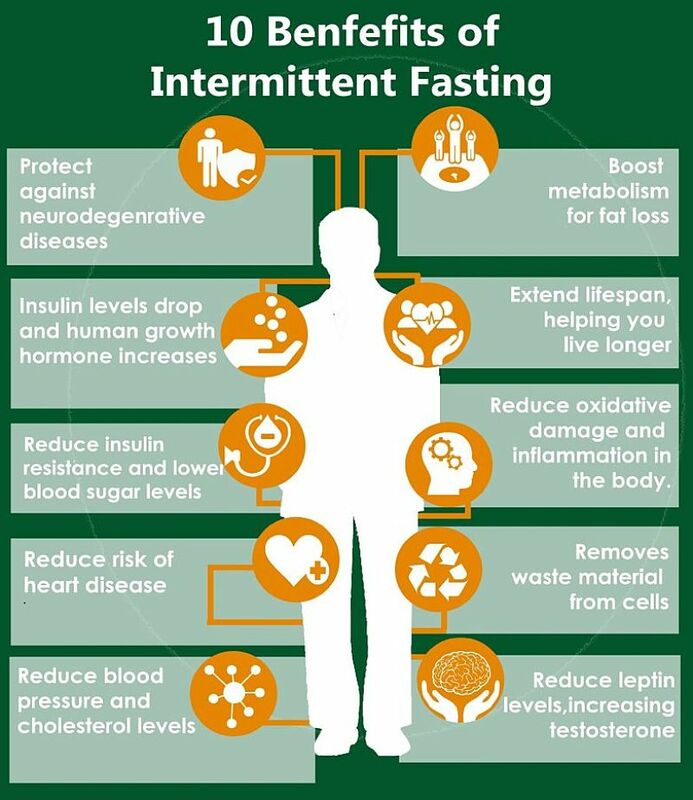 Research has shown that smaller calorie restriction and intermittent fasting can lead to weight reductions but nothing like those claimed. Despite all the claims made, the composition of the diet has been shown to not make much difference. What really matters is how many calories you eat not where they came from. All calories are equal. 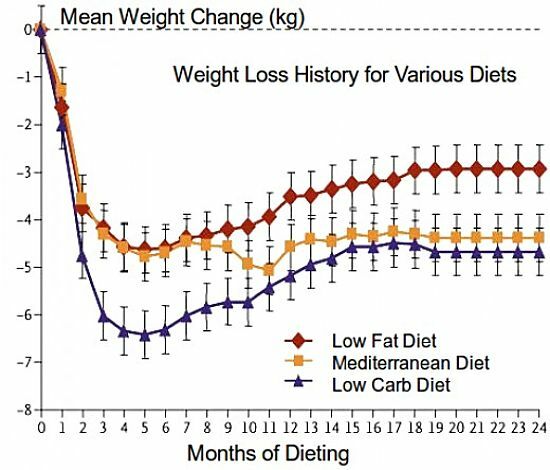 The various diets may have merit in terms of the way they help the dieter control the number of calories eaten, but if the calories eaten was the same the outcome of the weight loss was virtually the same..
For the research study, 800 volunteers were assigned to one of four diets: high fat, average protein; low fat, average protein; low fat, high protein; high fat, high protein. These were similar to the Atkins Diet, Dukan Diet (High protein, low carbs), Ornish and the Mediterranean style Diets (low fat). Each of the diets reduced the calorie intake of participants by 750 calories. The rate of weight loss over a 2 year period was very similar and range from 7-9 lb (3.2- 4 kg). Over the first 6 months, the participants lost an average of about 12 lb (5.4 kg), but many regained some weight. 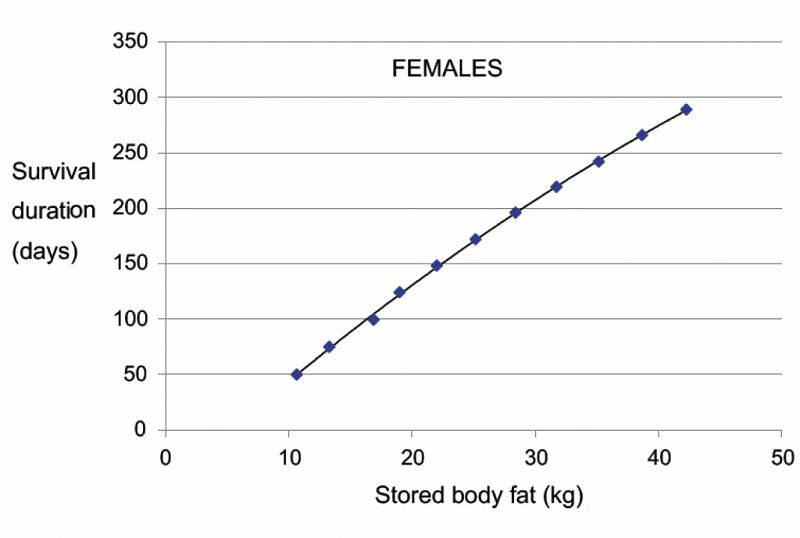 The figure below highlights the regain in weight shown for many people on diets. The result from this study are summarized in the table below. 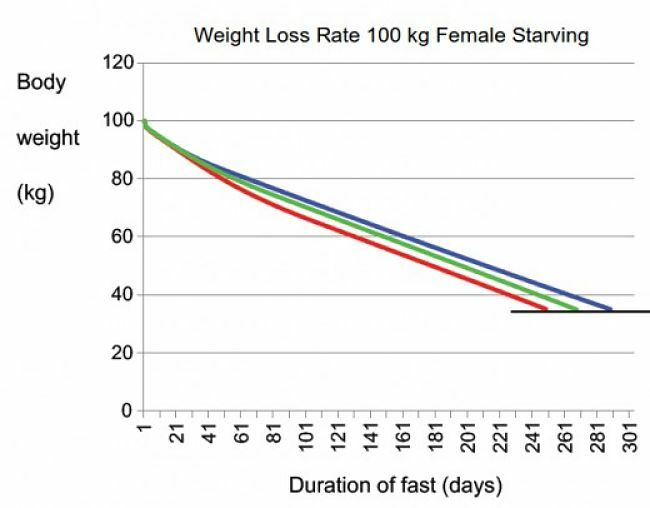 A recent review study developed and tested the weight loss rate expected under total starvation. Would Overweight People Survive Longer during Starvation? The study of starvation showed that people who are overweight would indeed last longer. The model predictions are shown below for males and females. A summary of the loss rates for various weight reduction strategies is shown below. Graphs of the loss rates for pounds and kilograms are also shown. The expected loss rates are much lower than those promoted for various diets and interventions. It is important that people have realistic expectations when dieting otherwise they can become disheartened and give up. Monitoring progress towards realistic goals is important to keep any strategy on track if the goals are to be achieved. A loss rate of 0.5 kg or 1 lb per week is a good reasonable goal that can be sustained over 6 months or more. The main cause is that most of our food is highly processed and crammed with fat and calories. Our high calorie food is calorie-dense, easy to obtain as fast and convenient foods, and is heavily marketed. Because of this, even people who eat normal meals and avoid junk foods still get fat and obese. Most people passively over consume calories eating 'normal' food because the food is so rich. Overeating is simply a normal response to the environment in which we live. Also, people now eat larger portions sizes, they eat more often and what they eat is stuffed with extra calories. Losing weight requires is simple – eat less, eat the better half of what you eat now and avoid processed foods. 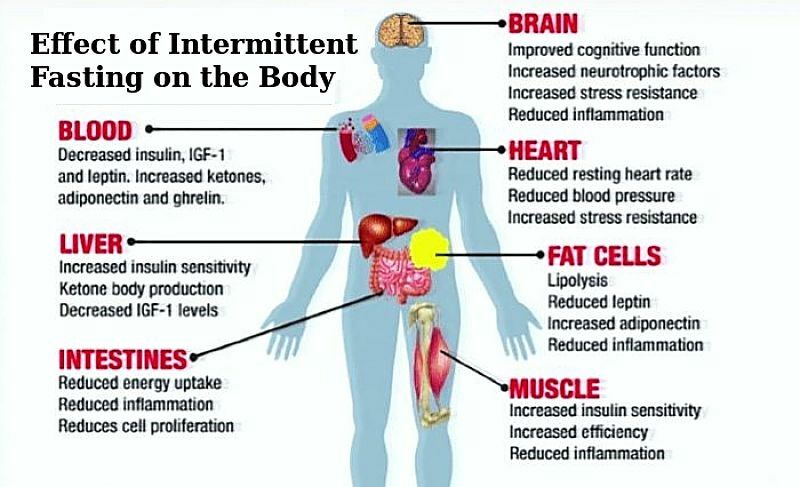 The hard part is the discipline required to control hunger and dealing with the maintenance phase in the long term. Studies have shown that an average reduction of 30% in daily calories consumed is required for sustain weight control. 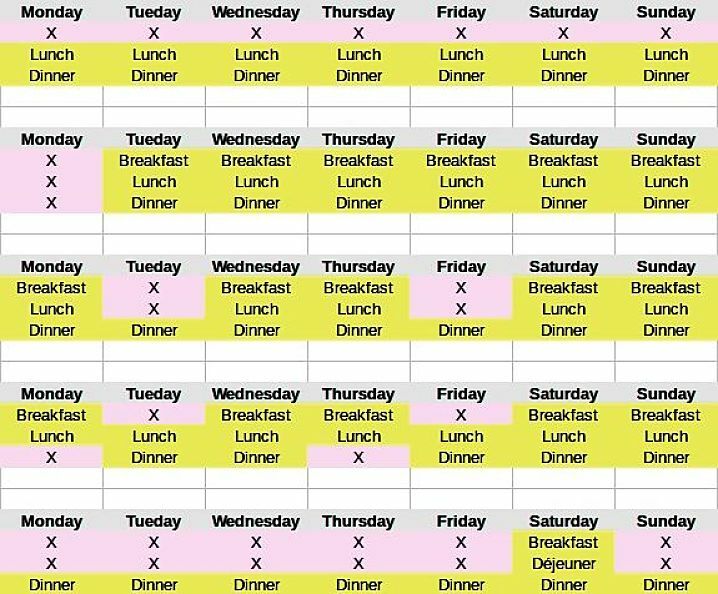 This is equivalent to eating 250-300 calories per day less than you eat now (equivalent to eating one small meal less every day). For obese adults, with BMI of greater than 35 the calorie redcution rate would be 500 Calories per day until weight falls to ‘normal’ levels.